"Mission to Mars"/"Star Light, Star Bright..."
Superman answers a distress call from the human colony on Mars. The colony is under attack by aliens that are using the colony's resources to terraform the planet. Superman recognizes them as Metalek. 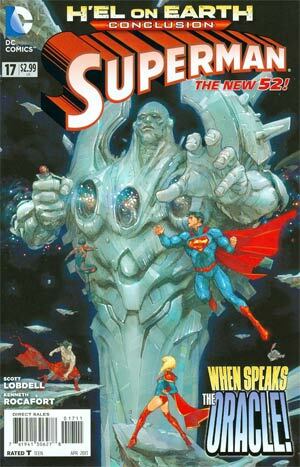 After the Man of Steel convinces Metalek to stop he reveals that the invaders are on the run from the Mulititude and that Earth is next on that race's list of planets to destroy. The only man to repel the Multitude was his father. The Multitude, looking like a hoard of angels, attacks. Superman can't fight them off and retreats back to the colony to figure out his next move. He theorizes that the Multitude is not a collection of entities but a single one with a million different points. If they can use the terraforming array to generate a Scallar Field into the Fifth Dimension they might be able to stop the Multitude. 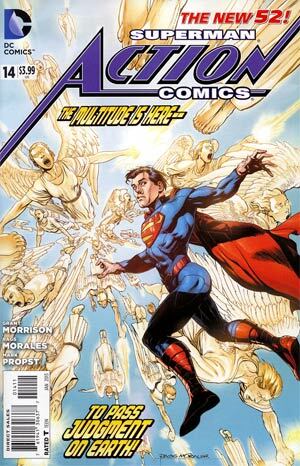 Using his own body as a conductor Superman and the researchers generate the field, which cause the "angels" to disappear. Superman finds what he thinks is a researcher, but it turns out to be Vyndktvx, the little man that has, for the past five years, been making deals with some of the villains Superman has faced. 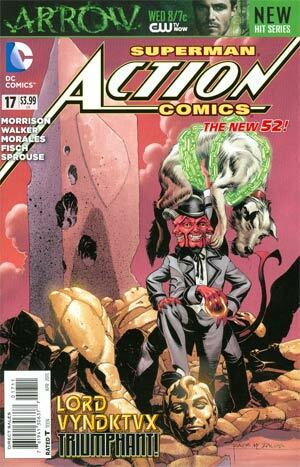 Vyn is there to conclude his business with Superman and after attacking the colonists he turns into a giant red devil. This is the moment Vyn has been waiting for./Superman and the Justice League fight off an inter-dimensional invasion before Superman has to fly off to meet with astronomers at the Hayden Planetarium in New York City. Neil deGrasse Tyson joins the Man of Steel and informs him that they have found the exact location of Krypton, which is twenty-seven light years from the Earth. Superman is able to see, in vivid detail, his home planet die. "Superman at the End of Days"/"And For My Next Trick"
Superman talks with his landlady, in reality a former princess from the fifth dimension, about his high school prom and then memories of an event that hasn't happened yet. She explains that Vyndktvx disturbs time like a shark does water when he moves in for the kill. Suddenly Superman is in the future and a group of villains are hunting him. Just as suddenly he is back with his landlady and they share a drink. She tells him of how Mister Mxyzptlk came to the land of Zrfff and cheered up the sad king. The king's daughter fell in love with him but another citizen of Zrfff, Vyndktvx, became jealous. Through his machinations the king died. Vyndktvx framed Mxy for the crime and forced him and the king's daughter, Clark's landlady, to hide on Earth. As she tells the story time folds around them until finally she is killed and in three different times Vyndktvx makes his final move./This is the story of how Mxyzptlk came to the land of Zrfff and charmed both the king and his daughter. She fell in love with the imp and even though an evil being made of spite tried to destroy them they managed to survive and escape to the three dimensional world. There they had a good life and gave birth to a child of music. Eventually Mxy's body died but somehow the baby holds the key to the imp's greatest escape act. "The Second Death of Superman"/"Future Tense: Tales of the Legion of Super-Heroes"
In 3030, Lightning Man, Saturn Woman, Cosmic Man and several other members of the Legion of Super-Heroes break into a secure facility and steal a time bubble. In current time (yesterday) Lois and Jimmy arrive at the Superman memorial statue to meet Clark Kent. They discuss the day Superman died before the Man of Steel crashes into the ground. He tells Lois and Jimmy to get to Metropolis General and find Mr. Triple X before it's too late. Xa-Du lands behind him and the two start fighting. Suddenly Susie, Lois' niece, attacks Superman mentally but Lois is able to talk her out of helping the little man Susie made the deal with. The fight continues until Vyndktvx appears and uses his magic to contact every person on the planet and offer a deal; he will give them life eternal in his forever kingdom as long as when Superman comes begging for help they say no. Krypto arrives just in time to stop the Anti-Superman army from killing Superman's spirit. The villains go to Vyndktvx for help but Krypto arrives and attacks the fifth dimensional devil. At Metropolis General Lois and Jimmy prevent Mister Triple X from being killed by an assassin and then wonder why Superman wanted them to come to Triple X's side. Two days previous Luthor and Vyndktvx stand before a machine that will serve as the ultimate anti-Superman weapon. An armored creature steps out of the machine and Lex demands that it be shut down. Vyndktvx tells him that it is much too late for that and adds that today is Super-Doomsday. In current time, the Legion materializes in Triple X's room and offers assistance as Super Doomsday asks Superman if he is ready to die./In the year 3013 the Legion prevents President-Elect Takaneda from being assassinated not once but twice from a man claiming to have seen the future. This man believes that Takaneda will plunge the universe into darkness leading most of the Legion to believe the man is delusional. This idea is only strengthened when Saturn Girl reads his mind and finds out he believes exactly what is he saying. The man dies and Takaneda thanks the Legion, adding that everything that happens from then on will be thanks to them. Later, as Takaneda drives away he assumes his true form as Universo and believes that the future looks bright indeed. "Superman and the Fiend from Dimension 5"/"Goodbye"
A young Clark Kent arrives at the scene where his adopted parents have had a terrible accident. Later at the hospital Jonathan Kent asks his son to take him home. 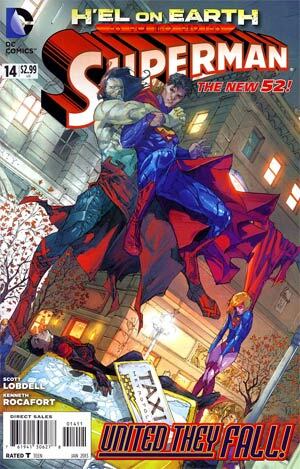 From his death bed Jonathan tells Clark to use his powers to become a force for good. Later Clark walks away from the graves of Jonathan and Martha Kent. 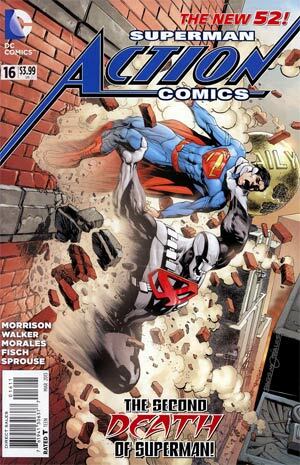 In the present Super Doomsday, controlled by Vyndktvx, savagely beats Superman again and again. Else-when three members of the Legion of Super-Heroes travel to various times in their last ditch effort to prevent Universo from rewriting the past. They arrive at the moment where Clark's parents were killed by Vyndktvx. Saturn Woman allows Martha to tell her husband she loves him one more time. Over the course of several years Vyndktvx manipulates events with Glenmorgan, tries to steal Superman's cape and then puts together a team of Superman's enemies to acts as an army of Superman-Haters. 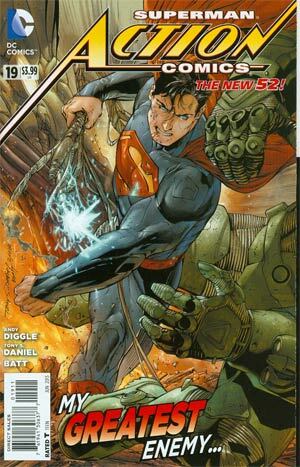 The battle between Superman and Super-Doomsday continues. Suddenly a voice calls for Super-Doomsday to step aside. 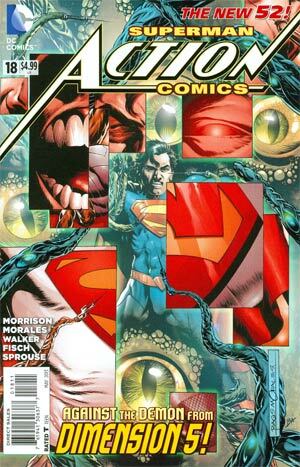 Superman and Super-Doomsday turn to see Lex Luthor in a giant suit of armor. Lex insists that nobody kills Superman but Lex Luthor!/As Superman fights in the present a younger Clark Kent is getting ready for the prom in the past. Clark and Jonathan are talking on the porch when suddenly the Superman from the present is standing in the place of his younger counterpart. He and Jonathan talk about the future and Superman's adoptive father reminds him that Kents aren't quitters. They hug and suddenly a slightly confused younger Clark is back. Jonathan tells his son that change can be scary but if he never tries anything new he'll never know what he can do. He adds that whatever life brings Clark he should meet it with his head held high because Kents aren't quitters. Lex Luthor lends Superman a hand against the Vyndktvx controlled Super-Doomsday but is taken out in short order. 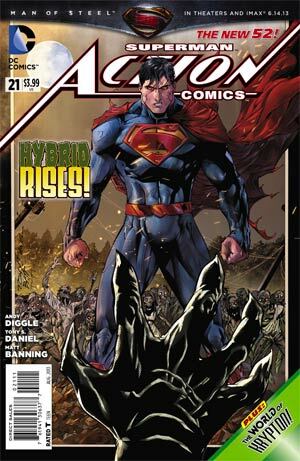 The Anti-Superman Army piles on Superman with one of their members causing the Man of Steel to hallucinate. The Legion, Lois and Jimmy are still at the hospital with Mxyzptlk when his son bursts in. He is actually a damaged edge of Vyndktvx who is carrying the shirt his mother was holding when she died. Mxyzptlk almost dies but Lightning Lad keeps him alive just long enough to tell them how to defeat Vyndktvx. Back at the fight Adam Blake arrives with a team known as the Wanderers and they take on the Anti-Superman Army leaving Superman free to face off against Vyndktvx. The demon from Dimension 5 grabs the Man of Steel who calmly reveals that he has had a lot of time to figure out how to beat him. At Superman's urging every man, woman and child says their names backwards which sends Vyndktvx back to the Fifth Dimension. The only problem is that the shell of Super-Doomsday goes into auto-destruct mode, but Superman is able to fly it into space where it explodes. Vyndktvx is arrested once he returns to the Fifth Dimension and Mxyzptlk and Princess Gzy marry and have children. The story of this is told to baby Kal-El by his mother Lara shortly before her husband comes in to tell her that Krypton is doomed. Mrs. Nyxly uses her last wish to help Superman save the team on Mars. Superman crashes back to Earth and is soon talking to Lois Lane on a cell phone as Clark Kent./In the year 2238 a small, alien boy witnesses an act of bullying of another alien near the Superman exhibit at the Noah D. Random Museum of Our Terran Heritage. The boy is so inspired by the various images and videos of the Man of Steel that he stands up to the bully, who backs down. The bully and his friends leave and the aliens celebrate. As they walk away the boy looks back at the Superman statue, which actually seems to wink at him. One year ago: Clark Kent and Lois Lane are sharing a celebratory drink in a Quaraci hotel bar when Clark receives a message from one of his sources. He rushes off and changes into Superman to investigate a lead on illegal weapons being smuggled into the Middle Eastern country. In short order he is flanked by a group of men in armor and after Superman tries to reason with them the men attack. The battle is fierce but in the end Superman throws the last punch. 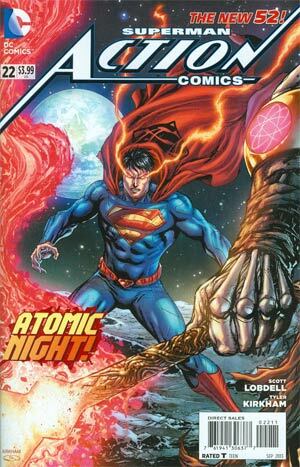 He confronts one of the men but after Superman demands to know where they came from the man bursts into flame and dies. Elsewhere Lex Luthor meets with his psychoanalyst and asks the doctor to not hold back in her diagnosis. She tells him that because of the abuse he suffered as a child and the early rejection by parental authority he's developed a malignant narcissism that has made him a sociopath and psychotic megalomaniac. Luthor points out all of his accomplishments and insists that he is above simple psychotherapy and tells her to come up with a better diagnosis that better fits a man of his caliber. 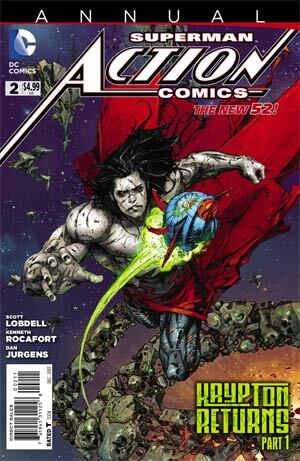 After the session Luthor meets with one of his minions and reveals that the attack on Superman in Quarac was set up to inject him with tiny nanites probes that would map his genetic structure and allow Luthor to attack the Man of Steel through his DNA. Lex put a tiny death machine inside Superman and the Man of Steel doesn't even know it. Three weeks later Superman is flying over Metropolis when Luthor's attack begins. Superman's hand is suddenly wracked with pain and he crashes to the ground. He tells the bystanders that have come to help to stay back because he doesn't know what's wrong. Superman looks at his hand and wonders if it is some kind of infection and by the looks of his hand and forearm that infection is spreading. "Hybrid" - Part 2/"The World of Krypton" - Part 1: "Discovery"
After a training session Lex Luthor is informed that Superman is down. Luthor is disappointed by this because he wanted the alien to suffer first. He orders the body to be brought to him so he can show the people the truth about the space monster that has been hiding along them. Meanwhile a very not dead Superman regains consciousness in The Block. Dr. Veritas informs him that his super immune system threw out the infection that was killing him. He will be weak but otherwise fine. When Superman comes into contact with the tissue that fell off his hand it comes alive and attacks him. The fight is brutal but Superman finally manages to defeat the virus come to life by trapping it and himself in a room filled with red sun energy. The victory proves short lived as the virus mutates and become harmful to the public. 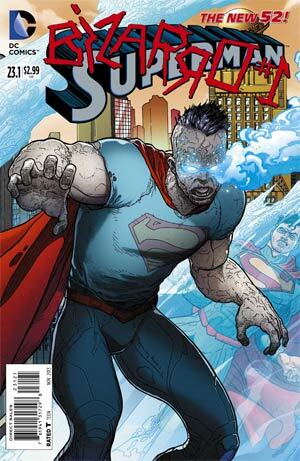 Despite being weakened by the infection and the battle he just waged Superman races into the fray and takes the virus on. 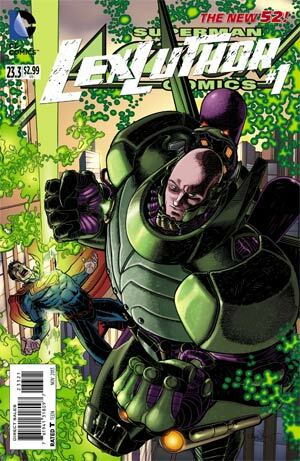 Meanwhile Lex Luthor dons a massive suit of armor and prepares to save Metropolis from the alien menace known as Superman./On the planet Krypton in the sea of Banzt Jor-el leads an expedition that discovers a form of life long since dead. Unfortunately this distracts him from a meeting of the Science Council, which causes much consternation on the part of his fellow council members and Lara Lor-Van, a cadet in the Kyrptonian military. She and an old war horse named Jax-Ur head into the meeting hall where Jax asks for her side arm. To the horror of everyone watching Jax-Ur kills a member of the Council while shouting, "For Krypton!" 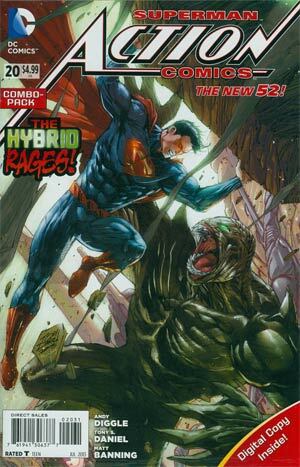 "Hybrid" - Part 3: "More Than Human"/"The World of Krypton" - Part 2: "Dissension"
Superman continues his battle with Hybrid and takes the fight to the sewers. Dr. Veritas teleports in a light device that mimics the rays of a red sun. She warns Superman to get out of there because he may not survive in his weakened state. Superman refuses and as her signal is disrupted by electromagnetic waves Superman is attacked from behind by a man in armor. The armored figure does a pretty good job of beating on Superman and soon he is revealed to be Lex Luthor. With the help of Lois Lane, who along with Jimmy Olsen had been following the Man of Steel, Superman is able to free Hybrid's victims. 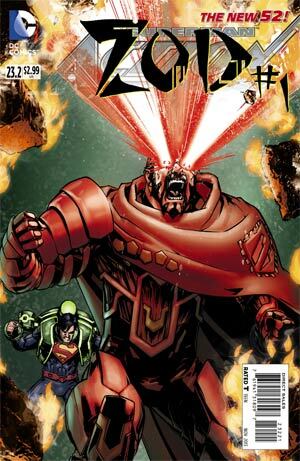 Lex Luthor stalks Superman in the sewers but Superman turns the tables and hits Lex with his heat vision. Superman rockets out of the sewers and flies into space. His hope is that direct exposure to the yellow sun will return him to full power. It works and Superman flies back to Earth and smashes into Lex. The fight is made public and thanks to Lois' account of what happened below the surface Lex is arrested. Later Jimmy tells Clark about the battle and soon they are joined by Lois. Clark gives Lois her phone, which she had dropped during the battle. Lois hugs Clark and tells him he is the best friend anyone could ever have. Soon they are joined by Lois' new boyfriend, Jon Carroll and as Jon and Lois leave Jimmy welcomes Clark to the friend zone. 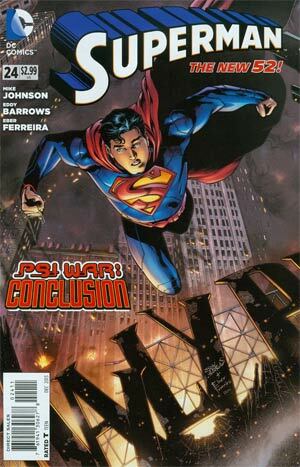 Clark is resigned to the fact that he and Lois are just friends but Jimmy points out that he is only human and that it is okay to hope./Security Cadet Lara Lor-Van kicks the weapon out of the hand of her Supreme Commanding Officer and demands to know why he has murdered a member of the Science Council. They fight briefly as the Officer explains that he is doing this for the greater good of Krypton. He tries to take her into custody but she fights back and escapes. Meanwhile back in the underwater ruins of ancient Xan soldiers close in on Jor-El. One of them tells the other to inform the colonel that they found the scientist and that neutralization is imminent. "Atomic Knights" - Part 1/"The World of Krypton" - Part 3: "Darkest Depths"
Hector Hammond is floating outside of an H.I.V.E. World Crusher that is in orbit over Earth when Straith, first Knight of the Pax Galactica suddenly teleports in. Straith destroys the World Crusher. The H.I.V.E. agents manage to get Hammond to safety. Meanwhile Clark Kent and Cat Grant attend a movie premiere. Clark catches the scent of Infinitium and when uses his x-ray vision he discovers that movie star Sir Harlan Quint is some sort of android. Before he can spend too much time wondering what is up with that Clark picks up a mental distress call that Hector Hammond is sending out for Superman. Soon Clark has changed to Superman and is in orbit over Earth. Hammond prods him into confronting Straith and things escalate quickly from words to battle as Straith knocks the Man of Steel off of the Moon. Lourdes, also of the Pax Galactica, arrives and tells Straith that the time for fighting amongst themselves is over. A threat greater than they have ever faced is waiting in the wings...a threat known as the Lexus./The soldiers that have surrounded Jor-El and his team demand that he surrender. Jor-El ejects from his underwater suit which causes the Teklons to become agitated. They attack the soldiers and give him and his team the chance to escape. Meanwhile the Colonel interrogates the surviving members of the Science Council. His goal; to find out the true purpose of a machine one of the council members claims is part of the power grid. After that Councilor is killed another, Kra-Hu, explains that it is a Sensory Harmonic Resonator but the only man that knows the machine's protocols is Jor-El. The Colonel reveals that he knows that the machine has been used to keep the Council members intellectually curious while keeping the populace in a peaceful state but that is about to change. Jor-El regains consciousness just in time to have another squadron of soldiers want to take him and his people into custody. Lara arrives and rescues them. As they race back to the Council Jor-El and Lara bicker but eventually agree to work together since they have both taken an oath to protect Krypton. At that moment the Colonel activates the machine, which he has changed to cause the people of Krypton to obey him without question. Kra-Hu accuses him of being insane but the Colonel replies that he has never been saner in his life and that there is no question to the righteousness of his cause. He acts in the name of Krypton, its lost people and for...THE ERADICATOR. "Atomic Knights" - Part 2/"The World of Krypton" - Part 5: "Fortitude"
Straith, first Knight of the Pax Galactica, asks if the Man of Steel would like to surrender before his comrades kill him in battle. His comrades, consisting of Seamus, Ordling and their leader Lourdes, banter back and forth before Superman attacks again. The fight is short lived as the true enemy, Lexus, finally arrives. Lourdes and her men surge towards the giant creature but when Superman sees the energy blast Lexus is firing after them he flies off to put himself between the blast and the warriors. The green rays injure him but Superman finally figures out that Lexus is a creature of magic, not technology. Lourdes reveals Lexus' origin; he was once her twin brother. Some sort of evil had infected his heart long before he started practicing the dark arts. Eventually he grew too powerful and became a threat so their father killed him and cast his son's dark heart into space. Evil, like energy, cannot die and over time he cloaked himself in the very planets he destroyed. Superman grabs her sword, flies into Lexus and pierces the creature's heart. As Lexus explodes Superman grabs the warriors and flies them towards the moon. There they all bow before him. In destroying Lexus he has become the undisputed ruler of the Pax Galactica. They are duty bound to obey his every command. Superman's first and only command is for them to go home and find another quest./When Lara's attempts to quell the Colonel's uprising end in failure all that stands between Krypton and destruction is Jor-El. For his part Jor-El refuses to help the Colonel and gives a speech about how Krypton is more than just a planet, it is an ideal. The Colonel back hands Jor-El and is about to execute him when suddenly a blast from behind ends the Colonel's machinations and the Colonel himself. Order is quickly restored and Jor-El destroys the machine that would have spelled doom for Krypton. With that done Jor-El introduces Kra-Hu to Commander Zod, an old childhood friend and the man responsible for quelling the insurrection. 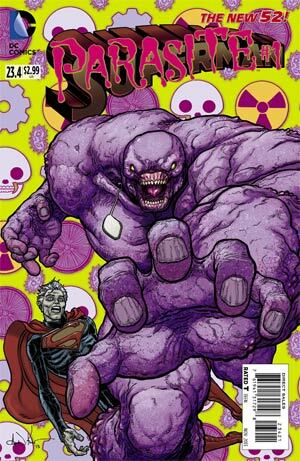 Brainiac lands on Argo and finds that most of the Kryptonians that initially survived the planet's destruction are nearly dead. He has his robotic minions bring him Zor-El, brother of Jor-El and uncle to the future Superman. It was Zor-El's distress beacon that brought Brainiac to Argo so even though Zor's intellect is not as great as his brother's he called for help and Brainiac means to give it to him. 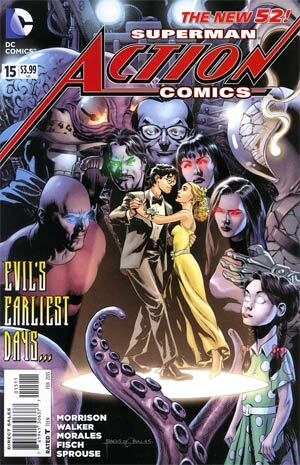 Brainiac has his robots strip away Zor's memories and alters his DNA so he will better resemble Jor-El. 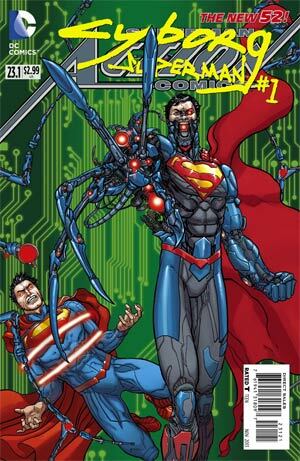 Brainaic also has cybernetic attachments grafted to him all in an effort to create the perfect Kryptonian. When Brainiac is finished Zor-El is no more and the Cyborg lives with one mission; search the universe for those worthy of perfection and brings them back to Brainiac for enhancement. The Cyborg leaves and as he travels from planet to planet seeking the best the civilizations he finds have to offer his backstory unfolds. Zor-El, like his brothers, was searching for a way to save the people of Krypton. Jor-El questions his brother's idea to use Brainaic technology to save Argo City but this doesn't deter Zor. At first he keeps his research secret from his wife and daughter but eventually Kara discovers his plans. Zor comforts his daughter but eventually sends her away much like Jor sent his son Kal-El to Earth just in case his plan doesn't work. Zor's wife Allura is glad her daughter survived but has completely lost faith in her husband especially after he uses the technology keeping them alive to contact Brainiac. Eight months after the destruction of Krypton Allura dies in his arms. After multiple attempts and countless worlds the Cyborg finds two subjects worthy of his attention. He makes them fight to the death to see which one is truly worthy and then has the survivor eat from the corpse of his brother. The survivor flees in terror as the Cyborg thinks that they are weeds...all weeds while he is perfection...alone in the garden of the universe. Young Dru-Zod and his parents are attacked while on a scientific expedition. One year later he is found by Jor-El and Zor-El. He grows up to be a soldier and dreams of battling the Char, a race of insect creatures that Krypton was once at war with. It isn't long before he gets his wish as the Char attack after decades of peace. Zod rallies his people and leads an attack that slaughters thousands of Char. Jor-El discovers that Zod used genetic material stolen from Zor-El's laboratory to create a hybrid to frame the Char. Zod is sentenced to the Phantom Zone but informs the council that they should make no mistake...HE is their monster. Lex Luthor is released from prison and immediately jumps back into his former life. He has his surgeons repair his face and then inspects some of the projects that have continued in his absence. After personally testing his assault armor Lex watches as the plans he has made since earlier in the morning come together. One of his shuttles loses power and crashes into the home of a rival of Lex's that had been threatening him all day. Not only did this eliminate an enemy but served to hurt the reputation of Superman, who has been missing all day. Lex's new assistant tries to call 911 but is killed for her troubles. The day ends with Lex boarding a helicopter and heading off to meet with Thomas Kord. His new assistant tells him how excited she is to be working with him. Lex tells her that of course she is excited to be working for him. He's Lex Luthor for God's sake. John Corben walks in the darkness intent on reaching his destination. He thinks of how eighteen months earlier he was in a catatonic state. General Sam Lane suggests that instead of sending him to Walter Reed Hospital that they give John a "jolt" with a sample of Kryptonite. The first rush of Kryptonite was intense but that was short lived as after running a battery of physical and psychological tests Corben is declared unfit for duty. Between the damage to his psyche due to his injuries and previous instances of excessive force the Captain giving the report decides that she can't be responsible for turning him loose. The General overrules her and Corben is sent into the field. Things go pear shaped in a hurry and after killing a group of insurgents at the expense of civilian casualties the government tries to eliminate Corben but he manages to escape. He walks along the bottom of the ocean and finally reaches his target; General Sam Lane. Lane confronts Corben and tells the cyborg that Lane gave him every opportunity to succeed but Corben's actions led the top brass to order his execution and because General Lane is a good soldier he carried out those orders. Corben threatens Lane and his daughter but it turns out that Lane was just stalling for time and Metal-2.0, the next stage in super soldier evolution, arrives. The battle is brief and in the end Corben emerges as the victor. Metal-2.0 activates his self-destruct program and the two cyborgs are engulfed in a fiery explosion. General Lane has his men comb the wreckage to find Corben's remains. Corben, it turns out, was rescued by the Secret Society. The Scarecrow offers Corben a chance to join the Society and to put his talents to good use. Seeing that his old life is over Corben accepts. He doesn't see himself as John Corben or even Metal-Zero anymore. Now he is only Metallo. At Metropolis General Hospital Lois' boyfriend tries to convince the doctor that she momentarily woke up from her coma. The doctor has a list of reasons why Mr. Carol might have thought he saw her wake up but in reality she didn't. When they return to Lois' room both men are shocked to discover that the comatose Lois has disappeared. At that same moment beneath Metropolis in the headquarters of H.I.V.E. the Psycho Pirate reveals that he knows that Superman is Clark Kent. Superman demands to know what the Pirate did with Hector Hammond and the H.I.V.E. Queen which confuses the Pirate as those villains were attacking Superman before the Pirate took them out. 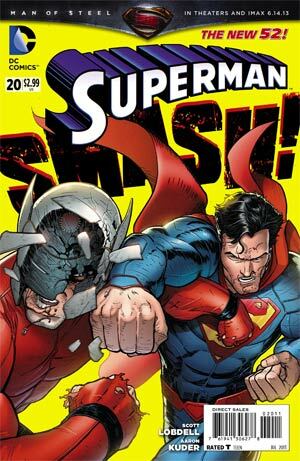 The Pirate leads Superman deeper into the facility and explains that the Man of Steel has no reason to fear him revealing the whole secret identity thing. They fly to the Swarm, which is a prison for the psychics that the Queen had been kidnapping for years so she could steal their energy. Her plan was to use them to mentally enslave first Metropolis and then the world. The Pirate had been trying to hide his fellow psychics but he couldn't save them until now. Some of the psychics that were kidnapped were part of The Twenty, a group of people that were left with incredible psionic powers in the wake of Brainiac's invasion five years earlier. Essentially they were test cases to see if humans could serve as vessels to be filled when Brainiac returns. The Queen was a true believer in this cause. The Pirate was the first of the Twenty that she kidnapped but he escaped and thanks to the Medusa Mask not only is he protected from other psychics but his own powers are amplified. As powerful as he is the Pirate still needs Superman's psionic energy and plans to take it no matter what. When Superman fights back the Pirate invades his mind and takes him on a trip through his memories in order to break down his mental defenses. The first memory takes place during his early career in Metropolis followed by one from when he was a teenager in Smallville and then finally on Krypton right before his parents placed him in the rocket to send him to Earth. 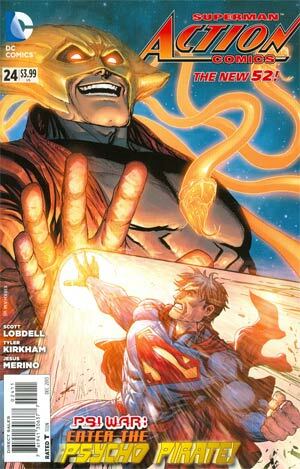 The Psycho Pirate's plan works but he is attacked when he starts to drag the Man of Steel away. His attacker turns out to be Lois Lane, who is glowing, blue and crackling with energy. She tells the Pirate that if he wants Superman or Metropolis that he'll have to go through her first. Superman is dealing with a Time Tsunami when he is suddenly drawn into a portal. Supergirl and Superboy join him but neither knows why or how they got there. The heroes notice that they are in the presence of the Oracle and Superman demands to know if the Oracle is capable of stopping the Time Tsunami. Instead of answering the Man of Steel's question the Oracle simply points and the trio is shocked to see a very much alive and very much not blown up Krypton. 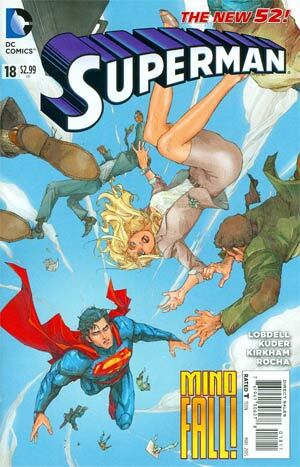 Kara rushes to investigate the planet but Superman suggests she be more cautious, which turns out to be the right way to go as the floating city they were flying towards attacks them. Suddenly they are transported to one of Krypton's moons where the Oracle possesses Superboy and tells them about the dangers they face. Superman and company thought they defeated H'El but in reality they simply sent him to the past where he learned his true origin. That revelation drove him insane and he killed Jor-El. H'El's goal became to rule Krypton and prevent its destruction. To that end he moved through time and space and along the way created different realities. He corrected his mistake of killing Jor-El and in one world the two became quite close but no matter what they did Krypton always died until the one day the many Jor-Els solved the problem once and for all. Supergirl sees that the Oracle's possession is hurting Superboy so she breaks the connection. 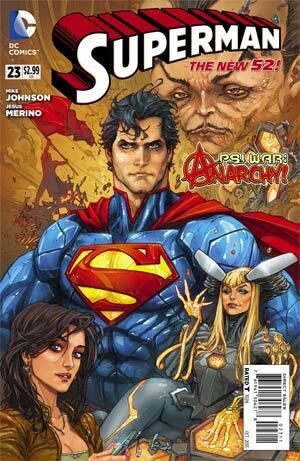 Superman is surprised by her sudden concern but before they can discuss it further a woman named Faora finds them. Supergirl is less than thrilled to see her as Faora was considered by many to be a terrorist, a traitor and worse. All of that is in the past she assures them because only by working together can they stave off the impossible, here and throughout the rest of time. After another tremor Faora explains that after her Lord Zod was killed she was without purpose. When H'El destroyed the Oracle's herald the Oracle needed arms and legs on the ground so he educated Faora which ultimately changed her. She then shows them how H'El has saved Krypton only to damn its people to a life of servitude. Superman realizes that the only way to save Krypton is to stop the Time Tsunami that H'El created. Faora agrees and adds that the three of them need to go back in time to the reality that started it all and make sure that Krypton follows her original destination. Superboy tries to attack H'El's forces but is blown out of the sky. Faora holds off the attackers allowing them to enter the three time portals Oracle has opened. They are each charged with a different mission and after an emotional good-bye Superboy and Supergirl fly into their portals. 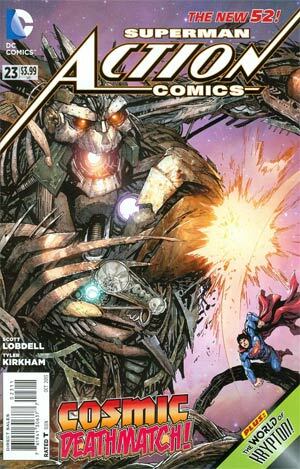 Superman notices that H'El has arrived but Faora sacrifices herself to allow Superman to go through his portal. Superman finds himself in Kryptonopolis a few months before the planet's destruction. Supergirl is transported to the wilds of Krypton during the Great War where she is immediately attacked by a group of clones. Superboy is transported to Argo City to watch over Supergirl and immediately runs into a younger Kara. Back on Kryptonopolis Superman enters the House of El and is shocked when he is attacked by his own mother. Back on Krypton's moon H'El uses his abilities to see what Superman and his comrades were up to. He discovers the Oracle's plan but is unconcerned. Time is on his side and Superman, Supergirl and Superboy are already dead. 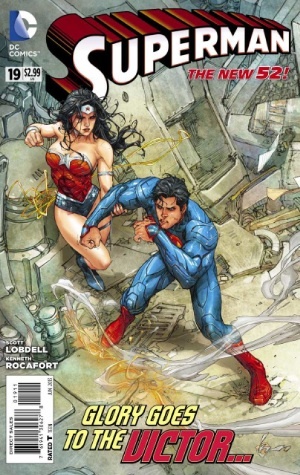 "H'el on Earth": "Build a Parachute on Your Way Down"
Lois confronts Clark in his apartment about his quitting the Daily Planet. Clark confronts her about moving in with Jonathan. She notes he appears to have a relationship of his own (not knowing it's Superman and Wonder Woman she's referring to). Supergirl barges in, and Lois assumes she's a cosplayer. Clark bustles Lois out, dragging Supergirl in, and whisking her away to Centennial Park where he tells her off for nearly revealing his secret identity... and then realizes she's speaking English! H'el reveals himself, embracing a dubious Kal-El. H'el claims he was mentored by Jor-El to man a test spacecraft before building the vessel that carried Kal to Earth. Clark doesn't believe any of it. H'el offers up Kon-El as proof of his knowledge of Krypton. Superman won't allow Superboy to be killed and he and H'el clash. To fool Kara, H'el masquerades as Kal, knocking her out. He transports Superman and Superboy elsewhere, before leaving to return to Kara. "H'el on Earth": "Because I'm a Scorpion"
Lex Luthor spends his days trying to figure a way into Superman's Fortress of Solitude, always ending in failure despite his intellect. Today however he has visitors. Superman and Superboy force their way inside the facility holding Luthor. Superman leads Superboy through a series of traps and measures which Luthor was tricked into building himself. Superman's armor is protecting Superboy and helping him heal. 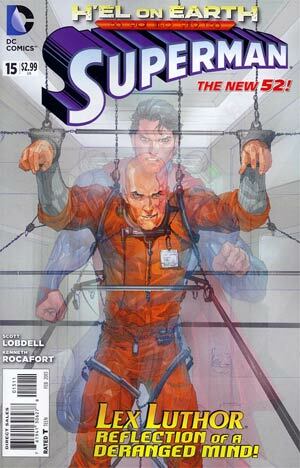 They come face to face with Luthor in his cell. He makes some comments about Superboy's "parentage" before revealing to Superman that he knows all about H'el and his plans to return through time to save Krypton by using a power source found in the bottled city of Kandor, which could work, but would destroy Earth in the process. Luthor knows that Superman would have figured this out for himself, and wonders whether Superman came to visit Luthor to find out whether he'd be able to push himself to kill H'el if need by, as he once nearly killed Luthor. 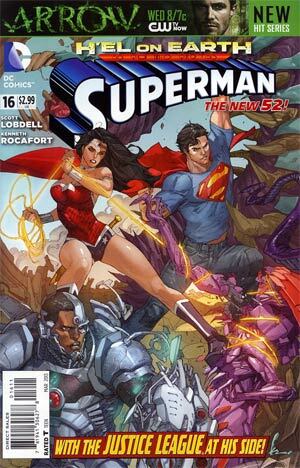 Leaving the prison, Superboy tells Superman about the Teen Titans, but Superman doesn't need their help, as the Justice League have arrived to help him take on H'el and stop him destroying the earth. "H'el on Earth": "A Fistful of Sticks!" 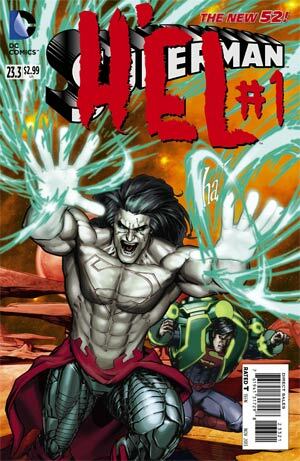 "H'el on Earth": Conclusion - "Fury at World's End"
On the orders of Highfather, Orion has returned home after time on Earth with Wonder Woman. Arriving in Undertown he makes short work of a Behemoth. Orion realizes that he likes the life on Earth. Elsewhere, Superman is standing in front of the United States Senate who want to inspect and catalogue the entire contents of the Fortress. Superman refuses bluntly. Morgan Edge arrives at the Daily Planet demanding to know the whereabouts of Lois Lane and is gobsmacked to hear that Perry has offered her a job as a reporter again and right now she is interviewing Superman on the steps of the Senate. Later that night Clark meets up with Cat Grant who unveils her new project - ClarkCatRopolis.com a website running all their content. Clark is taken aback and doesn't hide his thoughts about not wanting in on the project. Just then everyone at the club they're at begins joyfully leaping from the skyscraper club roof. Superman saves them all and detects a ghost signal being projected by the club DJ's equipment. The Partygoers begin to talk about distrust in Superman and the fact that he has an 'ice dungeon' which Cat picks up on her phone. Someone from afar is monitoring everything, admiring the mischief they caused this night. At STAR Labs in a coma Hector Hammond begins displaying some brain activity. Orion and he has been granted audience to the Prophecy Wall, which depicts a threat that needs to be taken care of... Superman. 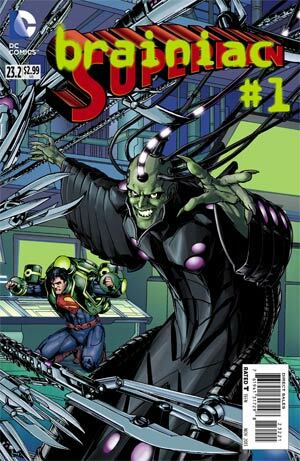 Superman is captured by a race of red sun powered aliens named the Sunturnians, invading Earth from their base on Neo Sol. Despite their invasion Superman is unusually calm giving them warning that in forty-seven seconds they'll regret their actions. Superman ends his countdown and Allysun realizes that they underestimated their opponent as he uses water towers from all across Metropolis to flood their ships and use his arctic breath to freeze the water. While this is going on he realizes he's late for Lois' housewarming party. His date, Diana Prince arrives at Lois' place. Jimmy and Jonathan gawp, while Perry White steps in to rescue Diana till Clark arrives. Over in S.T.A.R. Labs Hector Hammond's brain activity stops. When Clark arrives he experiences some strange visions, and has some even stranger interactions with Lois, Jon, and Perry. Orion arrives on Earth and heads straight for S.T.A.R. 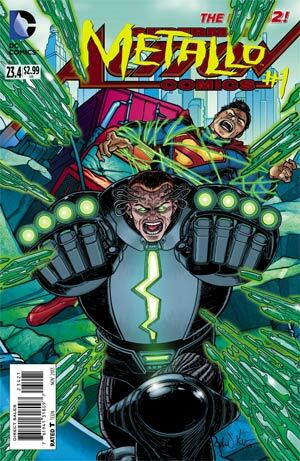 bursting in he finds the lifeless body of Hector Hammond and is disappointed to find that the extreme malevolent power he tracked to the lab was not the Superman that Highfather had sent him after. Hearing that Hammond's body is without a mind Orion realizes perhaps that Superman himself is the new home for Hammond's mind. On the balcony of Lois' apartment Clark and Diana are about to share a kiss when Clark is taken and dunked in the river. Changing into Superman Clark realizes the entire city was psionically manipulated and even his mind was affected as his thoughts were deliberately clouded. As he rises out of the water ready for a fight, a hand grabs his cape, Orion has arrived to ensure the prophecy is never successful. "Don't Mind If I Do..."
Hector Hammond and the H.I.V.E. Queen confront one another. Hammond incapacitates the guards and grabs the Queen by her throat. Elsewhere, Superman thinks over the events of the last few weeks and realizes that whatever is happening is psionic in nature. Later he meets up with Cat Grant and realizes she's putting everything into getting their online venture to succeed. He promises to use his leads on proving The Twenty to be real as a means to put their website on the map. The Queen tricks Hammond and escapes into the sewer system. Superman visits Jimmy Olsen in the Metropolis Grand Hotel and is worried about his friend and his extravagant purchases following the death of his parents. Jimmy is puzzled, he tells Superman his parents are missing, not dead. Superman is confused but shrugs it off as a mistake. An earthquake interrupts them and Superman soars down to investigate. Metallic tentacles erupt from the sidewalks and buildings. 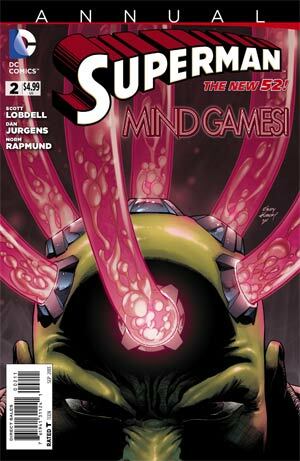 It's Brainiac tech and Superman is suddenly attacked by a mental blast. The H.I.V.E Queen drags Superman away, explaining that her 'father' Brainiac should never have left The Twenty behind. They have become super powerful and the Queen has a plan to protect the people in a way the now comatose Superman could never hope to. Hammond looks on and isn't pleased at all. 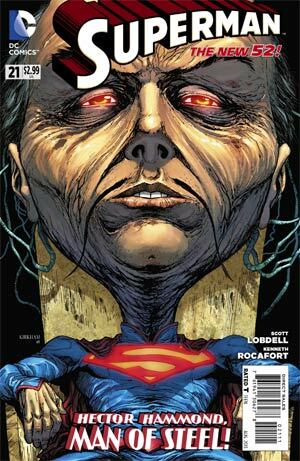 "The Last Byline"/"World of Krypton": Part Four - "Eradication"
When a woman mysteriously approaches Lois before dying from her own psionic powers, Lois investigates "the twenty", a missing group of people who vanished after Brainiac's attack on Metropolis. He search takes her finds three more of the twenty, one of them being Senator Hume, who transfers his powers to Lois which sends her falling out of the building, with a huge cranium and death looming./On Krypton Jor-El and Lara are captured by the colonel, who plans to use the Harmonic Resonator (which Jor-El built) to brainwash the population of Krypton to follow his cult. Four years ago, a nerd, one of Brainiac's Twenty runs into the packed Metropolis Museum of Art and puts on the legendary Medusa Mask and becomes the Psycho Pirate. In the present, Superman has been captured by the Queen of H.I.V.E. He and all the humans merged would make a perfect gift for Brainiac's return. Superman attacks the Queen with heat vision. She in turn attacks in Psionic fashion and Superman realizes his limitations against mental attacks. Queen manifests eight psi-clones and they attack the Man of Steel together, overcoming him once again. Across the city, Lois Lane, now also one of the Twenty, is in hospital in a coma. She awakens, screams and mutters Superman's name. An angry Hector Hammond attacks the Queen's Psi-clones. She sends a wave of psi-zombies, including Superman to return the attack. A smug Hammond reveals he isn't even there, he is back in the H.I.V.E base safe from harm. Queen gives chase but as she does her grip on Superman weakens enough to awaken him. The Metropolitans attack but Superman can't bring himself to fight them and chases down the Queen back to her former base. Superman wastes no time racing to the heart of the base and is shocked to find it turned to rubble. Hector Hammond is normal again with no powers, broken and beaten. Superman digs him out of the rubble and shrapnel and quizzes him on Queen's whereabouts. Hammond reveals Queen is dead and Superman should run. A puzzled Superman turns to meet Psycho Pirate who scans his mind quickly and asks, "Mind if I call you CLARK?" After an earlier tussle with Superman, in which he obtains a blood sample, Lex Luthor begins working on creating his own Superman/human hybrid using an unsuspecting boy named Bobby. The nanotech injected sample doesn't have the planned effect, rendering Bobby a hulking brute over which Lex has no control. Unable to stop his creation, Lex bombards the boy with increased sunlight, causing the creature to grow until it bursts. Taking samples of the goop left over, Lex vows to do better next time. While preparing to collect and destroy the planet Noma, Brainiac retells his story to the planet's leading scientist, explaining why and how he went from being Vril Dox on the planet Yod-Colu to becoming the Collector of Worlds, and how it's all in an effort to thwart the destruction of those planets by the 5th Dimensional beings known as The Multitude. The scientist records and sends the message of Brainiac's admission out into the galaxy, where it is picked up and deciphered by Dr. Veritas, who thinks Superman will want to know about this. In astral form, H'El hovers over his body as Jor-El studies it. Excited by his findings, Jor-El heads to the Council, but is rebuked. On his way back to his lab he crosses paths with Zod. He shows his old friend what he's discovered, and theorizes about Krypton's past and future, unveiling the House of El rocketship he built. This stirs memories in the astral H'El who realizes he was created in that ship when it travelled through space. Rejoining his body, H'El lays waste to the lab, killing Zod, and then also killing Jor-El, before taking the spaceship and flying off, vowing to rule Krypton. The Justice League comes after the new Green Lantern, demanding answers about the missing Hal Jordan! Just as the team gets back to Earth, they are interrupted by Superman. There's a Black Market alien technology being fenced and the Man of Steel has traced a connection to the Red Hood! Though he saved the entire world from the Rot (without praise or thanks), Swamp Thing realises he's unable to save everyone. Swampy travels to Metropolis to speak with Superman, the one hero who confronts more than any other the dim reality that not everyone can be saved.